Many thanks to Sensei Stacey Kelly - 2nd dan IJKA, for hosting Kato Shihan 9th Dan World Chief Instructor of the IJKA, in Tuam in Western Ireland last weekend. It is an unenviable task to be responsible for making all the necessary arrangements and keeping Sensei entertained. At one point in the weekend Stacey had to become Sensei's personal shopping assistant, Sensei did not appear to be at all bothered that all the shops were shut. With Stacey's organisational skills she somehow managed to persuade a shop keeper to open their shop three hours after they had closed to allow Sensei to make a purchase. Saturdays training started with a beginners and childrens class, however Sensei Steve Cameron, Rebecca and myself were not allowed to escape and got roped in to additional training. The main class followed with a good attendance of approximately twenty dan grades and twenty kyu grades. Sensei focus was on Kihon and it definitely made things easy with every kyu grade partnered with a dan grade. On Saturday Sensei taught Kibaken Nidan, a kata performed entirely in Kiba-dachi. By the end of training I thought I would never walk normally again. On the Sunday session Sensei taught Fushu, a Kato-ryu kata, this will be Kato Sensei legacy kata so I am sure we will practice it again. Above: Group photo taken on the Sunday after training. The Sunday session was a little less well attended, due to extended travel arrangements for some karateka but proved another great session. Sensei Stacey should be particularly proud of her two Yellow belts who are of a very strong standard indeed. The Emerald Isle calls again. On Monday Claire and I had yet another anniversary (24th) to celebrate we are having six days in Ireland. It will give us a couple of days before Sensei Kato's course and a couple of days after to just unwind and do some sight seeing. It only seems the other week Rebecca and I were in Fermoy (oh it was just the other week!) and now back again. I might even get a chance of a small Jameson and a half of "black velvet". Hopefully Bex's won't keep nagging on this trip. Joining us in Ireland will be Fran, from Dr. Jonathan's dojo and Steve Cameron from Worcester. Sensei Steve Cameron 3rd Dan IJKA has just added a lot more detail on the Worcester club website. Steve is working hard to build up his dojo, if you are ever in the area give him a call and drop in for a bit of extra training. 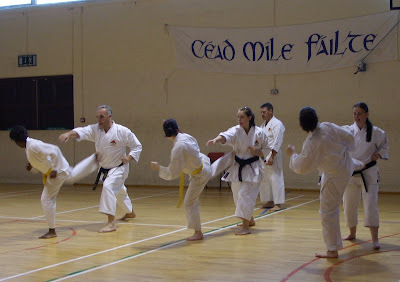 I have added a permanent link to the site from our links section so you can keep an eye on what Sensei Steve is up to. Click on the yellow buttons below to return to the "HOME" or "Worcester Club"
Is Yahara Shihan the "Angel of Kata"? If you have never viewed "the committee's" unique Kata blog you may well want to, and with a little bit of thought make your own contribution. This panel of high ranking dan grades are very hard to please and have a reputation at being ruthless in their rejection. It is like the "X Factor" but with 4 Simon Cowells! Click on the yellow buttons below to return to the "HOME" or " Unique Kata" blog to view "The Angel" AKA Yahara. A little kumite motivation to watch as you train for the JKS competition in Nottingham. A lot of brilliant footage here, but you will need a bit more control in the UK, enjoy, Osu! Many thanks to Sensei O'Keeffe for posting on You tube "Kashu" also called "Hi no te" this is the "Fire" elemental kata devised by Asai Shihan following on from the mainstream kata of Unsu. The kata is performed by Sensei Makita, Matsui and Watanabe as a demo in Japan at this years JKS competition. The Team kata is followed by Sensei Makita and Matsui as uke as Sensei Watanabe performs the bunkai. As you would expect a great video. The second video is from Latvia, "Kibaken Shodan". I believe Asai Shihan created Kibaken Shodan with the intention of it being the first in a series. Kato Shihan has devised Kibaken Nidan, Sandan, Yondan, Godan and Super Kibaken to complete the series. These and many more Asai Ryu kata can be found by clicking on the links from my kata page. Click on the yellow buttons below to return to the "HOME" or "Kata" pages to view "Kashu" or "Kibaken Shodan" kata. Sensei was back in York for his autumn course and grading. Many thanks to Sensei Ian and Mike for hosting the weekend. As well as attracting karateka from the IJKA Yorkshire clubs of Haxby, Selby and York, we were also very pleased to see Karateka from Sensei Anne Hastings dojo, Leeds, Sheffield and members of the "Whitchurch Mafia". Saturday for the first two hours was mainly focused around Kihon and Kihon Kumite, the third hour was was for black belts only learning the Kato-Ryu Kata Kibaken Sandan. Sunday morning, more Kihon before the higher grades (purple belts up) went through Tekki Shodan and Hangetsu, but using sanchin and neko-ashi dachi instead of hangetsu and kokutsu dachi stances. While students graded the black belts had no time to rest they were put through their paces learning Kibaken Yondan and Godan. I was very pleased to get Kibaken Sandan in my head in one session, but Yondan and Godan will take a few more visits before I even have the sequence of moves. Well done to all out students, Shauna graded to 11th Kyu, with Amy and Ellie achieving 10th Kyu. 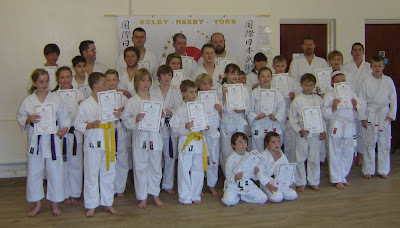 Nathan, Jake, Leila and Liam were grading to 8th Kyu, achieving 3 full grades and a temporary grade for Liam. (Stronger kumite required Liam). Julie and Abby attained Yellow and Jammie only just missed out on a full grade but still gets to wear his yellow belt with a temporary pass. Josh and Lewis were attempting the big step up from yellow to green belt. Both the boys came away with temporary grades, a good result for both these youngsters and they must now work on a period of consolidation before moving on. Kelvin, Alan and Lucy all graded to 4th Kyu, excellent! Again you will need to work hard for best part of a year before you make the next big step up in grades to brown belt. Both our brown belts were successful Michael attaining 2nd and Josh 1st Kyu, well done! A comment from the grading panel that your kumite was not as focused as your kihon and katas, something to work on in the next few months. 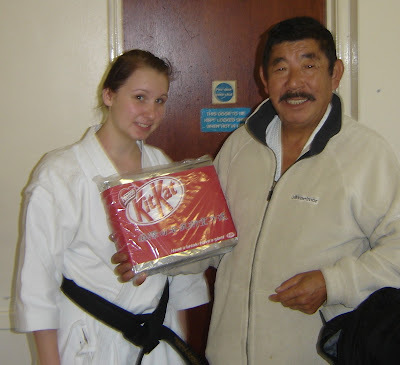 After the presentation of the certificates Rebecca presented Sensei with a hand made 3Kg Kit-Kat. The massive four finger chocolate biscuit was hand made at Nestles in York and as well as the famous Kit-Kat logo sported the Kanji of the IJKA. I have just written out the grading forms for the weekend and would like to wish all our karateka well, we will have approx 20 members grading. Josh will be grading for 1st Kyu, a big step and Sensei will be expecting a very high standard. It seems an age since Josh joined us as an Ex Wado-ryu karateka, he found the change to shotokan difficult but has persevered where many would have given up, good Luck. Michael is grading to 2nd Kyu, just back from Ireland where he did the club proud and with a little more experience and a luckier draw will soon find himself placed in competition. He has a couple of injuries from Ireland so I hope they will not effect you at the weekend. Unfortunately you will not be able to take it easy on Saturday and save yourself for Sunday, Sensei will be watching you. Kelvin, Lucy and Alan our purple belts will not find their grading easy it is tough in these middle grades, you are still building your karate foundations. I can see where the additional Wednesday sessions have accelerated improvement though. Josh and Lewis will be attempting green belt, a big step for these youngsters, you are both good enough but you must stay focused. Bring your karate heads at the weekend! SSKC will potentially gain a lot of additional colour belts, Julie, Abby, Jamie, if successful will all progress to Yellow belts. Grading for 8th Kyu and well on the way to their yellow belt in the new year will be Nathan, Jake, Leila, Liam and David, it takes a long time in our association to gain your first coloured belt but keep up the good work you are nearly there! Last but definitely not least are our beginners and Pee Wee grades David, Amy, Ellie (shortcake) Shauna and Joseph. It is easily said, but just try and relax and enjoy yourself. OSU! A whistle-wind trip to the Emerald Isle this weekend for Michael, Rebecca and myself. We flew out of Liverpool Saturday night, picked up a car from Cork airport and drove the short trip North to Fermoy. After an overnight stay in a B&B we drove into town to try and find the sports centre. Rebecca had been there before and remembered it was "up a hill", we looked for a while before asking directions. I felt a bit of a fool when the gentleman pointed to the Loreto Sports complex all of 50m away. Rebecca and Michael competed in both the U19 and the senior events, while if you are going all that way you might as well get as much experience as possible. As always the male cadet brown and black belt section was very strongly contended. Michael was surprised to see so many Strong Sho and nidans in his group. Michael fought well and was complemented on his efforts by a number of the spectators and coaches. Not taking anything away from Rebecca's success but the female sections are not as strongly contended. However at seventeen Rebecca did have her work cut out in the Senior Kumite that had a few preliminary rounds. 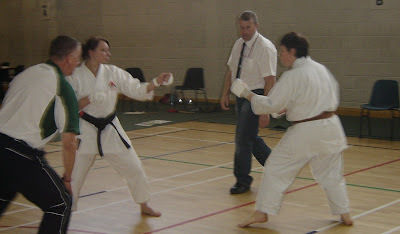 Rebecca ended up competing against Sensei Stacy from Tuam (who we are meant to be staying with in a few weeks time). This was a particularly strong match, well fought by both of them resulting in Rebacca winning through to the final where she met Sensei Jacquie. 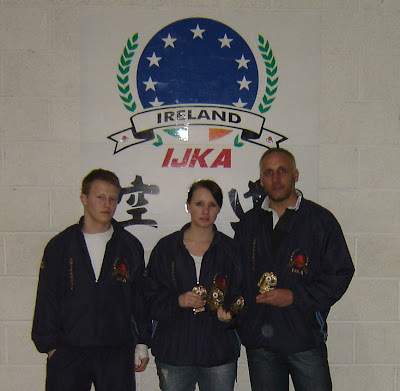 Rebecca had met Jacquie in Italy and she has to be considered one of the most experienced competitors in Ireland, Jacquie was again to be the IJKA ladies grand champion. Toomey Sensei was a little short of officials and had asked me to help out. I was a little daunted by the prospect. I have judged and refereed at our club competitions but never contemplated taking a role in a national. I started as a judge on the junior kata, but come the kumite sections I was asked to referee, surprisingly I really enjoyed the experience. With no veterans section I had to enter the Senior kata and Kumite. My kata performance is not as good as it should be and I should make more effort really. I did perform a strong Tekki Shodan (one of my preferred kata) to win through to the 2nd round where I made a complete "hash" of Jion (again another one of my preferred kata?). In a way I was glad to get the kata out of the way so I could warm up properly for the kumite. It was a very strong line up of fourteen, Michael was one of only two or three brown belts amongst the dan grades. I had been goading "Hammer" one of Sensei's PJ's students that we were going to get drawn together and he was going down, as he was too slow. I have known "Hammer" for a few years, he is less than half my age and only does kumite. I won my first round and funny enough I was drawn against "Hammer" in the next. It was a strong contest, but I eventually won through. My parting comment to Hammer was , "another win for the veterans then!". In the Semi final my opponent caught me with a perfect Oi Zuki Jodan, hard but controlled, for me it should have been Ippon but unfortunately the nose didn't stand up to the blow very well and ended in his disqualification. Not the way that I would want to get into a final, but as Sensei PJ put it later that is the way that competitions go sometimes. Sensei Kato 9th Dan IJKA chief instructor is coming to the Haxby Dojo at Wiggington Recreation Hall on Saturday and Sunday 10th/11th October 2009. If you are grading you MUST attend the course as well. Please ensure that you attend as many sessions as possible as we approach grading. Paul will collect Training and grading fees in advance, so we can make a single payment on the day.